We've become pretty open minded when it comes to food and traveling. There are definitely some different "delicacies" around the world, and even though some of them sound a bit strange to us North Americans, the locals in these other countries don't think twice before popping it in their mouths. So we're anticipating trying some different foods while we're in Africa. What's popular over there? Hmm. What the heck are "boerewors"??? Turns out they are a famous local sausage! Now, keeping in mind that Namibia has a strong German history, this is not surprising. "Monkeygland sauce" actually does not contain any monkey parts at all. It's a sort of chutney pickly product. And "mieliepap" is a very traditional southern Africa type of porridge made with ground maize. Okay, sounds like a great dinner to me! Bushman Sosatie “local is lekka”. Selection of Ostrich, Crocodile, Zebra, Kudu, Oryx, (Ostrich & Zebra Seasonal) served with mango chili sauce, mieliepap croquettes & salad. Ostrich, crocodile, and zebra. Hmmm. Apparently ostrich and zebra are a seasonal food! Namib Bush Fire “local is lekka”. Ostrich, Springbok and Oryx fillets with red wine sauce, (Ostrich seasonal) straw potatoes, a tot of Witblits & salad. "Witblits"? Turns out that witblits is a popular home brew, like a type of distilled brandy. I guess they put a quick shot of that in there somewhere! Other menu items? Zebra Steak, Oryx fillet, and Kudu Loin Steak with Mushroom sauce. 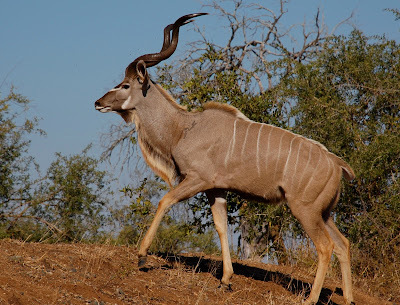 The kudu is a common type of African antelope. We've tried deep fried grasshoppers in Mexico. And iguana soup. And horse meat is popular in Iceland. We haven't been to Asia yet, but we've read about some of the more different types of things people eat over there. Of course guinea pig is popular in some South American countries. Iguana soup. Tastes like chicken. Very similar to frogs legs! A big bowl of deep fried grasshoppers! Yum! What types of different food have you tried? I ate a cricket in Cambodia and attempted to eat the leg of a spider there as well - yuck! Had to spit that out. The cricket was salty and crispy and is considered a great snack there....once was enough. Having had a much loved guinea pig I could not bring myself to eat a guinea pig in Peru!!! I think the cricket would have been much the same as the grasshoppers we had in Mexico and they weren't that bad actually. Good for you for a least trying the spider leg, I think that we probably would at least try it now too. Traveling has really opened up our eyes and minds to trying new things, including weird foods. I was REALLY brave and tried deep fried catfish at a buffet in Las Vegas. Exotic (to me) foods are just not gonna make it past my lips!! When I was a kid we had friends who were missionaries in Kenya. They ate all kinds of things and it never hurt them so I guess I'm just a wimp. Pass the potatoes, please. I used to be a real fussy eater, I am not sure what happened but now I will eat lots of things that I never used to eat and am much more willing to try something new and different. As you said, you saw people in Kenya eating different things that didn't make them sick so chances are they won't make us sick either, it's just a matter of getting past it in your mind, not always something everyone can do. In South Korea, I ate steamed silkworm pupae, dried cuttlefish, and steamed snails. I've also eaten lots of things from the sea that I didn't know what they were. The wife thinks I'm strange to eat something unknown. I probably am! Once, in China, at a round table with a lazy-susan-type serving tray, I tried "something" and found that I liked it so when the dish on lazy susan came to me again, I took a second helping - thinking it was some sort of mushroom or vegetable in a delicious sauce. I was just taking another bite when somebody across the table said, "It has bones!" Dog? Also tried 'cuy' (guinea pig) in Peru several times - once in a private home where the cute little guinea pigs run around the kitchen until their turn comes! As for advertising great finds ... QUINOA (keen' -wah), which is grown high high in the Peruvean Andes has the highest percentage of protein of any grain in the World - 17%. I love the flavor and there're lots of ways to serve it. Great source of protein and other nutrients. I think I would have a very difficult time trying to eat dog because I would only be able to think about our Whiskey. I think the only way I would be able to do it, is if I didn't know, like you. Yep, quinoa is definitely good for you, especially if you are a vegetarian. I don't eat meat other than fish but my nephew and hubby (Mr Sft) had a kudu burger and Wildebeest lasagne in Swaziland. I've just found your blog and am looking forward to reading more. Mr Sft and I went to Namibia in 2005 and it was AMAZING! Infact we are planning a massive African adventure in 2020 when we travel from Cairo to Cape Town so we will be returning to Namibia again. You are going to have a FANTASTIC TIME!!!!!!!!!!!!!!! I think we could eat a Wildebeest lasagna or a burger, of course it would have to be gluten free. I am looking forward to trying some different foods while we are in Namibia and South Africa. Wow, that sounds like the trip of a life time that you are planning. That would be something like going from Canada or the USA all the way to the tip of Argentina.That will be a very interesting read that we will look forward too. From your travels to Namibia in 2005 let us know if there are any must sees other than the biggies, Skeleton Coast, Namib Desert and Etosha National Park. All sounds quite interesting, I like alligator, frog legs, pig tails, beef, chicken and pork hearts and livers, catfish, snails(escargot), chicken tails, cod tongues and cheeks. Willing to try most anything. So glad that you are willing to try almost anything, not too many people will admit that they would. Chickens have tails? That is an interesting combination. How did you like them or didn't you? I've only gone so far as to *try* shark fin soup at a Chinese wedding once. Once was enough. Thought it was rather horrid. And let's not talk about how it ends up on the table. Just nasty business. You could be quite right on that Bob, I guess we related sausage to Germany only because we also know that German is one of the main languages there. Now there's a few choices I would not have thought about for a BBQ. We have definitely heard of having bear, rattlesnake and ostrich but the others would not even have occurred to us. Glad that you were will to give them a try.